"There are a handful of books out there that have the power to change the world for the better. Strategy, Leadership and the Soul is one of them. So thank you, Jennifer Sertl and Koby Huberman for writing it. step up and model responsible and moral behavior. Again, thank you Jennifer and Koby for showing us the way." attention to migrate from analysis – and may be paralysis – to prescription. What should we be doing to cope with the growing changes, being experienced by us as individuals and as professionals and even institutions?" Fred Zimny . Read the Full review here. "I love this book! It bursts with fresh ideas and redefines what a true leader is today - and more importantly tomorrow. This book is pure gold for any business wanting enduring success." "As you read this book, you realize that this is a new paradigm for business leadership – a sort of new breakthrough in 'organizational mathematics'. The book offers a sensitive and accurate viewpoint of all the factors which compose the newly regenerated version of the business world; a world where small and agile businesses, closer to their customers and able to provide flexible solutions to their customer needs, are going to leapfrog and bypass the established 'experienced' business giants that are too slow to figure out what is happening out there. The three anchors in the book – Strategy, Leadership and the Soul – provide the coordinates to understand the new organizational dimensions. Beyond intellectually enjoying the original analyses in the book, I gained a new 'GPS', which helps me 'recalculate a new route' in any dynamically changing situation." control' to 'communicate and enroll' is essential today, as is engaging all employees in strategy conversations. This is a book for everybody that believes that business sustainability, in the uncertain times we live in, is possible." 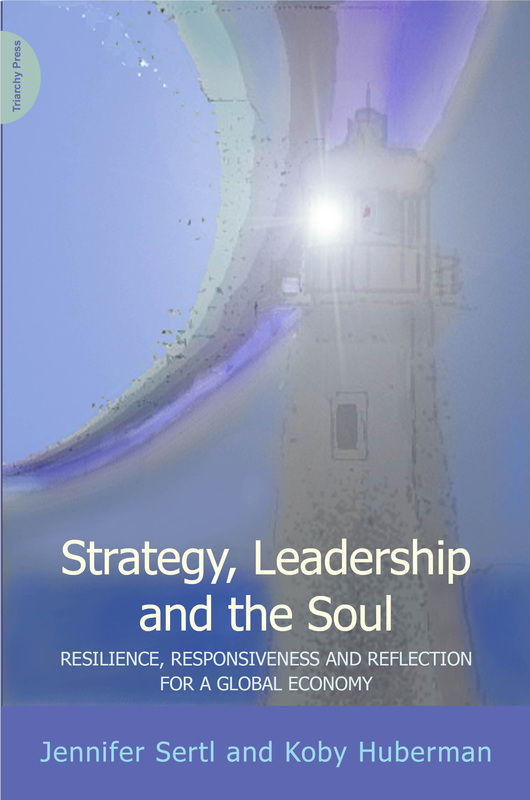 "Strategy, Leadership and the Soul presents an insightful view of the future that will be embraced by transleaders and create bewilderment for those who cannot make the transition to a world where customer knowledge and desires set the pace for value creation”. Rick Plympton, CEO, Optimax Systems Inc.
"Humbleness and leadership – two words seemingly from different sides of personality. Can they be at peace with one another, or better still, can they create a harmonious combination? As CEOs in today’s world, we need to allow the collective and individual creative intelligence of our employees to shine like never before. We need to enable greatness in others by giving them the opportunity to express themselves while we provide the foresight for a greater future. This book shows you how to do this. Let it also drive you to self reflect on who YOU are and who YOU want to be as you prepare for your next challenge." Gabi Seligsohn, CEO of Nova Measurement Instruments Ltd.
makes us answer tough questions. Read it twice!" "Strategy, Leadership, and the Soul is a timely and prescient addition to the business knowledge landscape. It is often difficult to understand the complexities and subtleties of the changing business environment while struggling to cope with our own internal operations and preconceived mental models. This book clarifies the factors causing dramatic transformation in the economy and society, and provides a guide for both the personal and the organizational adaptation needed to meet the challenges of the future." "This book explores the concepts - Strategy, Leadership and the Soul; what they mean, what they should mean as well as how they are related. First off, there is a lot of information in this book, presented in an extraordinarily professional manner. It communicates as an entity stating an objective and then proceeds with fulfilling that objective. Upon completion of an objective there is a summation or recap. The style of communication is clear, precise and does not include unnecessary fluff or filling. Yes, it is a lot of information. But this book should be able to keep your nose in it for the duration. If you have a pulse and you see your leadership position as a profession; inclusive of moral, ethical and professional standards you cannot afford to miss this book."